March is Youth Art Month and I have been wanting to share some of the drawings my kids have created lately. I just hadn't gotten around to scanning them until today. I've been toying with the idea of starting a meme called Inspire Me Monday or something of the sort...but, that would require creating a button for the meme...and getting the word out, and planning more posts, and... geez, why isn't there more time in the day?! Please do let me know if you'd be interested in participating in such a meme to share things of beauty that inspire you and feed your soul. Could be kids art, could be photos you've taken, anything you've created, a song you love, a poem, etc. Just a way to celebrate the beauty around us and find a little light in these otherwise dreary times. I'll try to get my act together and organize a post for next Monday. 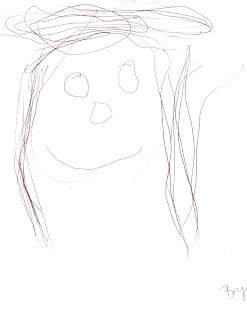 The first drawing is a self-portrait that my daughter created. She is 4. She actually drew pictures of everyone in the family. I love them all and am thinking of making them into charms for a charm bracelet...eh hem....a great Mother's Day gift, don't you think? 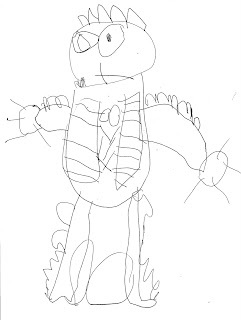 The next one is a picture my son drew of a dragon. He is 7. He was playing with his Lego Castle set and then decided to draw this. I just love these because they are things they simply felt inspired to create. I didn't sit them down for a lesson, or prompt them. They're just freehand doodles and the simplicity and imagination of them touch my heart. Here is a link to some art lesson plans compliments of Crayola (scroll toward the bottom of the page). Incredible Art has lessons by grade level. Cool! Arty Factory has some really cool lessons online for more advanced artists and upper Elementary through teens. Find more free art tutorials at Art Graphica, also for more advanced kids...or even mom. If you have a post on art that you'd like to share, please leave a link in the comments! I'd love to see it. Those are just precious. I love them. I used to put away all my kids art till I ran out of room in my closet,lol. My older one never was much of a colorer or drawer.He's getting into in now in his teens. My little one loves to color and draw. I must say he's really good at it. Those are really some great drawings there! A family of ar-teeeests! Congrats on all your talent over there!